The construction of the facilities for the JUNO neutrino experiment has been initiated with an official groundbreaking ceremony near the south Chinese city of Jiangmen. Involved in the Jiangmen Underground Neutrino Observatory (JUNO) will be more than fifty institutions from China, the US and Europe – with six from Germany alone. Starting in 2020, JUNO will begin to produce new information about the particle characteristics of the neutrino. "The aim of JUNO is to precisely measure the oscillations of neutrinos for the purpose of investigating one of the major issues in neutrino physics today – the sequence or hierarchy of neutrino masses," explained Professor Michael Wurm of the Institute of Physics at Johannes Gutenberg University Mainz (JGU). He is acting as one of the German JUNO partners and was at the site to watch the start of work on the underground lab. Neutrinos are elementary particles that have next to no mass and that are emitted by processes such as fusion in the sun and radioactive decays of fission products in nuclear reactors. They have no electric charge and are subject only to the weak nuclear force. This means that they can penetrate matter almost unhindered and can only be captured using massive detectors that are usually located underground. There are three different types of neutrinos – electron, muon, and tau neutrinos. They can change from one type to another, a phenomenon known as neutrino oscillation. It is possible to determine the mass of the particles by studying the oscillation patterns. "Oscillations only occur because neutrinos have three different masses. But which is the lightest of the three and which is the heaviest? The JUNO experiment will be sensitive enough to allow us to clearly sequence the three neutrino types," said Wurm. The particle physicist, who is also participating in the Borexino experiment that investigates solar neutrinos and is located under Italy's Gran Sasso mountain, sees this as an important step forward for the experimental efforts to find a violation of matter/antimatter symmetry in neutrino oscillations. Scientists hope to find out why matter and antimatter did not completely annihilate one another after the Big Bang. It will only be possible to determine the sequence of neutrino masses through tiny changes in the oscillation patterns that cannot be detected by currently running experiments. The JUNO detector is thus being built in its own underground lab, which is located some 50 kilometers from two reactor complexes on China's southern coast. The neutrinos emitted by the reactors will be registered in the form of small light flashes in the liquid scintillator target located at the center of the detector. Carefully shielded from radiation background, 20,000 tons of the mineral oil-like target liquid will be contained in an acrylic sphere of 35 meter diameters. Its outer surface will be equipped by a dense array of light sensors detecting the scintillation light. Six years of construction are foreseen for the new detector that will be 100 times larger than the Borexino experiment. Upon start of data taking in 2021, the scientists expect that another five years of measurement will be necessary to answer the question of neutrino mass hierarchy. 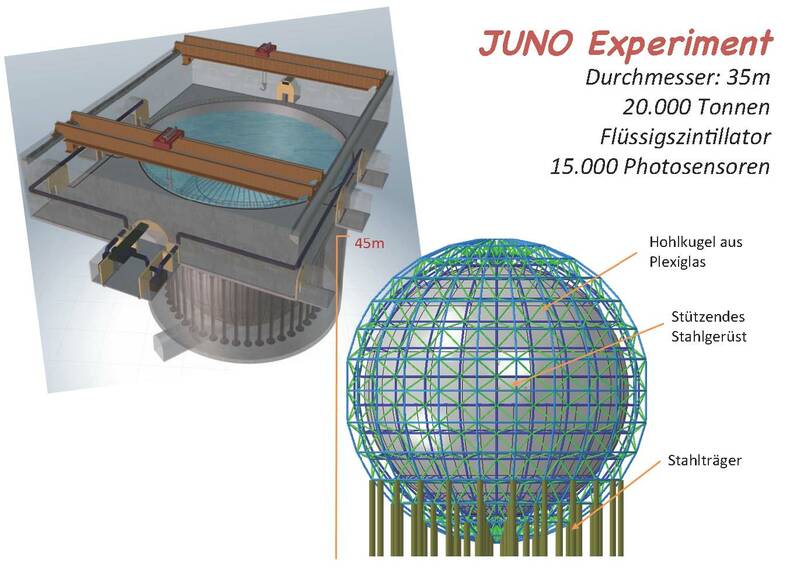 Schematic depiction of the JUNO detector showing the shielded acrylic sphere (lower right). The detector is surrounded by a pool of water to protect it against background radiation (upper left).